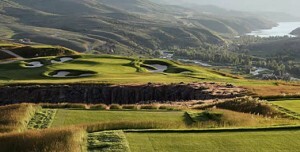 Park City, Utah – Sottsdale-based OB Sports Golf Management has been selected to manage the golf operations at The Club at Victory Ranch. Located only 17 miles southeast of Park City, Utah, Victory Ranch boasts a par 72, Rees Jones-design that is situated atop a plateau and offers endless 360 degree views of the Wasatch and Uinta Mountains, Deer Valley Ski Resort, and the Jordanelle Reservoir. OB Sports will manage all aspects of the golf club operations including operations, agronomy, food and beverage, instruction and golf marketing. “We are very pleased to bring on OB Sports, with their golf expertise to provide us with support and direction…and most importantly pave the foundation for future success here at Victory Ranch,” stated Victory Ranch project director, Jeff Graham. Located near award-winning ski resorts, local reservoirs and National Forests, Victory Ranch offers the best of Western living with wide open spaces, 360 degree mountain views, lush woodlands, coupled with outdoor adventure and luxurious amenities. In addition to the Provo River that runs through the property, the centerpiece to the Victory Ranch community is the spectacular 7,599-yard, 18-hole Rees Jones-designed Club at Victory Ranch.. Honored by Golfweek Magazine as one of the Top 10 Best New Courses in the Country, Victory Ranch features endless vistas from the high plateaus on the golf course where, at 7,000 feet, altitude golfers are treated with 20 mile views of the Wasatch and Uinta Mountains. While Victory Ranch offers a prestigious membership to its owners, the club will be unveiling new unaccompanied guest play opportunities for golfers throughout the region to experience the club first hand in 2011. Situated on 5,600 acres of pristine land adjacent to the Uinta National Forest and Wasatch-Cache National Forest, 84 percent of Victory Ranch is planned to remain open space, creating a feeling of solitude and connection with the land. Approximately 600 residences are planned for the community, which includes one- to six-acre homesites and spacious cottages. An ideal residence for the outdoor enthusiast, Victory Ranch Club offers hiking, biking, cross-country skiing, snow-shoeing and horse back riding trails in the backcountry of its property. In addition, the Victory Ranch members have access to world-class fly fishing along four miles of the Upper Provo River.